Located on the radiator core support fan guard. 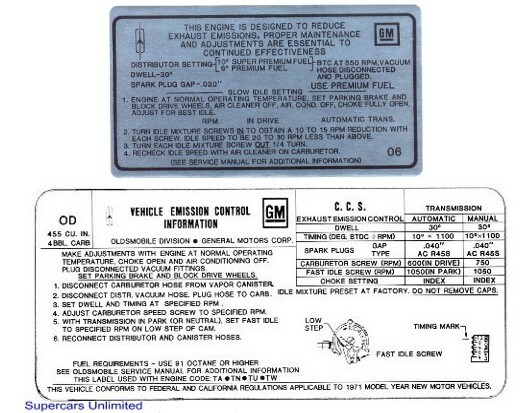 The emissions decal provides tuneup information. Letters in parenthesis are the code that appears on the decal. 68-69 style upper, 70-72 style lower picture. 1969 350 4bbl AT or MT (OU) THIS ITEM HAS BEEN DISCONTINUED. 1970 4-4-2 MT (SE) THIS PART HAS BEEN DISCONTINUED. Olds Cutlass 442 Emission Tune Up Stickers and Decals.